It is high times for the NFC South. In 2010 they were the only division in football to boast three teams with double-digits in wins. They housed the defending Super Bowl champions (New Orleans) and scored the NFC’s No. 1 seed (Atlanta). Tampa Bay established itself as an up-and-comer and even though Carolina was the worst team in football they were able to secure a Heisman Trophy winner (one of two drafted into the division this April) to bolster the franchise. So it’s good times all around, right? Well, if there is one thing that the NFC South has proven over the past decade it is that it is one of the most volatile divisions in football. Since NFL realignment back in 2002 there has never been a repeat division champion from the South, and there have been more worst-to-first turnarounds in this division than any other in the league. Things change quickly in this league. And following an offseason unlike any other I think some dark clouds could be on the horizon for the sunny South. Offense: The Saints have possessed one of the top offenses in football over the past three seasons and they used free agency and the draft to bolster this unit. Former Heisman winner Mark Ingram and electrifying Darren Sproles enter a backfield that underachieved last season. The Saints retained several free agents on the offensive line and may have even upgraded by bringing in Olin Kruetz. Drew Brees is still an elite quarterback and he needs to do a much better job of taking care of the ball this season after a turnover-plagued 2010. But he still has all of his receiving weapons (sans overrated Jeremy Shockey), and the reality is that as long as the line holds up in the run and the pass, and as long as the Saints hold onto the football, the skill players are going to continue to fill people up. Defense: Our last vision of the Saints defense was Marshawn Lynch juking what seemed like half of their defensive roster. But that’s not a great reflection of how well the Saints defense – which finished in the Top 7 in the league in points and yards allowed – produced last year. And they loaded up this offseason. By adding Shaun Rogers and Aubrayo Franklin the Saints beefed up their rush defense significantly. They also have an underrated back seven, led by Jon Vilma and Tracy Porter. This team had huge problems allowing the big play last year and their safeties have not played nearly as well since Darren Sharper left town. They will be aggressive with Gregg Williams’ blitzing schemes, but I worry about them blitzing themselves into bad situations too often. Skinny: New Orleans really had the deck stacked against it last year. The Saints had a championship hangover, a brutal schedule, and several statistical factors working against them last season. They still won 11 games. By all accounts their workouts during this bizarre offseason were as sharp and as organized as any team’s in the league. Mix in an underrated free agent haul and I think that the Saints are one of the two or three best teams in football, even if they haven’t played like it so far this fall. The New Orleans Saints schedule is again rough. But if they take care of the ball I think they will overtake Atlanta this year. Offense: This is a multidimensional, multifaceted offense that is among the most efficient in the game. The skill players – Matt Ryan, Roddy White, Michael Turner, Tony Gonzalez – are among the best in the league at their respective positions. And the emergence of either rookie Julio Jones (rookie wideouts never do much, though) or Harry Douglas is going to be crucial for this group taking the next step. The past two years they have had to work way too hard for points because of a lack of big plays. They need to remedy that. Atlanta dodged a massive bullet by resigning two of the three free agents on their offensive line. That was crucial. Defense: I don’t love anything about this unit. But there is also nothing that I can point to as a glaring weakness. Another critical move this offseason was keeping Brett Grimes. He is among the most underrated secondary players in football. The linebackers are young and solid, but not spectacular. The front four is also solid but they don’t generate enough pressure on a consistent basis and that hangs their good-but-not great secondary out to dry. Atlanta brought in Ray Edwards to shore up the pass rush. But he isn’t opposite Jared Allen anymore and Edwards has been hampered by a knee injury. I think his impact will be muted and lack of depth on the line could become an issue. Again, this whole group is just “good”. But I don’t think they are good enough to get to that next level. Skinny: I can say that I am definitely torn on this team. The last time they had this much hype was 2009. I was predicting a letdown year while everyone around me here in Atlanta had them touted as a 12-win team. I was right, as they won nine games and missed the postseason. Well, they have a TON of statistical factors – from yards per point on offense and defense, to schedule strength, to Pythagorean Wins, to overachieving against their Vegas win total – that point to a letdown year again this season. I think that they could be a huge disappointment. But on the other hand I really do like this team and I don’t think there is a doubt that they are a Super Bowl contender. I really think they could have a season like Green Bay did last year – nearly miss the playoffs, followed by a great postseason – and I am as interested in this group as any team in the NFL. Offense: The trio of Josh Freeman, LeGarrette Blount and Mike Williams is as gifted as any 1-2-3 combination in the NFL right now. I’m not saying, “young 1-2-3” combo, I’m saying they can compete with anyone. And this group should only improve as they grow together, assuming that they can stay out of trouble (Never a given.) . Even so, the other young receivers – Briscoe, Benn, Stroughter – give them numerous weapons to play with. I am still not 100 percent sold on their offensive line. I think they played a bit above themselves last year and I think a couple of the guys in that group are overrated. (I’m looking at you, Davin Joseph.) But Tampa Bay’s attack is trending upwards and will continue to do so as long as they stay disciplined and focused in those games where they need to grind out first downs and not just rely on big plays. Defense: This unit made significant strides last season after a couple of ugly, ugly years. Just like the offense, most of this unit is made up of young, aggressive players. And with Raheem Morris plugging that speed into the Cover-2 the early results are promising. Ronde Barber is one of the best corners in NFL history and is still playing at a high level. But beyond that, I don’t know that anyone has stepped up to elite class yet. The corners are nice. But the safeties are very suspect. Also, depth along the defensive line was a problem last season as the year wore on. I don’t feel like they addressed that issue yet. They have several potential breakout stars – especially at end – but I don’t think they are as strong on this side of the ball as what New Orleans and Atlanta are packing…yet. Skinny: It is going to be interesting to see how this team responds to the newfound expectations. I felt like this was one of the teams most hurt by the lockout because their young players could use the extra “study time”. Also, Tampa won’t have the benefit of last year’s cushy schedule, in which they went 1-5 against playoff teams prior to a Week 17 win over New Orleans’ backups. Tampa was a big overachiever last year and they won several close games that I don’t think there is any way they should have won. Things aren’t going to break their way again this year. We will find out what we need to know about where this organization is headed based on how they respond to that fact. Offense: For about the seventh year in a row the Panthers enter the season with one of the worst wide receiving corps in the NFL. And that includes the incomparable Steve Smith, who is doing it all by himself. That is definitely not going to help the development of Cam Newton, who I am firmly on record as to saying I wouldn’t have taken at No. 1 overall. His lack of accuracy is a killer right now. 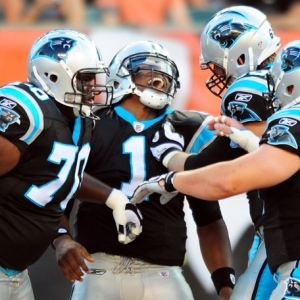 But Carolina still has a solid offensive line; this unit is better than it played last season. And if their running backs are healthy then this team can still pound some people on the ground and take the pressure off. But eventually they have to throw. And unless Newton improves a lot in a hurry this attack will get buried. Defense: There were few groups in the league last year that put forth as game of an effort as the Panthers defense. Their stop unit was just throttled by injuries to key players and by the second half of the season they were shackled by one of the worst offenses of the past 10 years. But these guys went out and competed and the depth they developed could pay off this year. Ron Rivera is a great defensive mind, but I don’t know about his hire of Sean McDermott as defensive coordinator. These guys desperately need Jon Beason to stay healthy. He had foot surgery recently and likely won’t be ready in the season opener. They won’t repeat (or improve on) last year’s numbers without him. Skinny: I saw a glimmer of hope from this group this preseason. But then I looked a little closer. This cupboard is still pretty bare and they lack depth and impact players at so many positions. I am not a believer in Newton. But there is a little spark there and if he doesn’t get his brains beat in he could pull off an upset or two later in the year. Look, they have a new quarterback, new systems on both sides of the ball, a new head coach, and a paper thin roster. It will be bumpy again. But this bunch showed last year that they will compete and I expect a similar effort this season.